In September 2016, the City of Houston retained a consulting firm at a cost of $565,000 to develop a long- range financial plan to address the City’s structural budget deficits. As was Captain Renault in Casablanca, I know that you will be shocked to learn that their principal conclusion is that you should be paying more property taxes. Specifically, they want to repeal the property tax cap that voters imposed on the City in 2004 and raise property taxes by 83% over the next ten years. The report projects that if the property tax cap is left in place, the City’s property tax receipts will rise from $1.16 billion this year to $1.52 billion in ten years, a 30% increase. That is about what you would expect with the cap in place. But they are projecting that expenses will go up by about 36%. According to the report, this will result in a cumulative deficit in the general fund over the forecast period of $1.9 billion dollars. The report projects that the annual shortfall will be about $125 million next year and will gradually grow to $285 million by 2027. 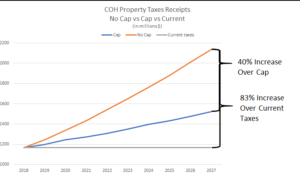 While the consultant did not have the courage to actually say exactly how much property taxes will go up if the cap is repealed, it projects that the repeal would wipe out the $1.9 billion deficit and create a $900 million surplus. So, we can infer that the repeal means that property taxes would go up by $2.8 billion over the next ten years if their recommendation is adopted. When you do the math, that ends up equating to 7% annual increase every year in the City property tax receipts for the next ten years. 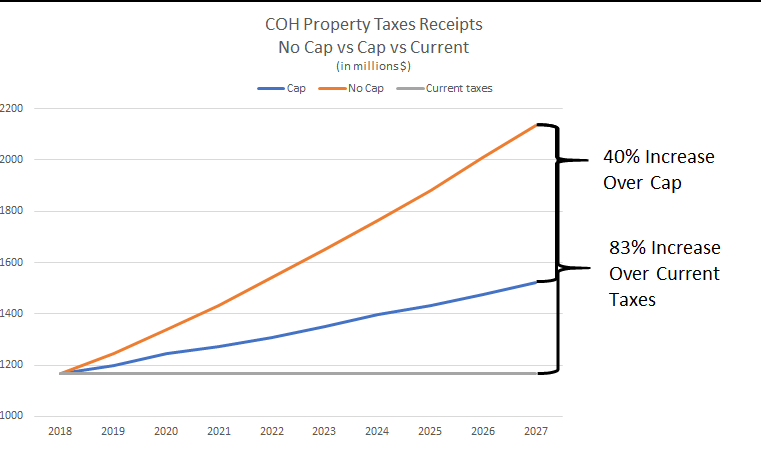 By 2027 you will be paying 40% more in property taxes than if the cap stays in place and 83% more than you are paying today. And that does not even include the additional taxes you would be paying that would go to the TIRZs. The report also identifies certain “initiatives” it claims would save an additional $300 million. Many of these initiatives are sound and some of them have been recommended in previous studies but never implemented. But some are also pretty outrageous, like their suggestion that non-profits should start making annual contributions to the City since they are exempt from property taxes. So, all you churches out there get ready to start “contributing” to the City. But even if these initiatives were implemented – and they won’t be – $300 million is less than 1% of what the City will spend over the next ten years. Seriously? The City is run so efficiently that we can only save 1% of what they are spending?? By the way, the report also projects that the average personnel cost for the City’s general fund employees in 2027 will be over $150,000 per employee. A glaring omission from the report is any mention of the TIRZs. The TIRZs are already siphoning off nearly 15% of the City’s property tax revenue, the majority of which is funneled into wealthy landowners’ pet projects, like the Uptown bus lanes boondoggle. Lifting the property tax cap and allowing City Council to raise property tax rates by 7% per year would flood the TIRZs with more cash. I am going to try to run the numbers and see how much more revenue this proposal would generate for the TIRZs, but can you imagine what new boondoggles the TIRZs would cook up with a huge influx of new money? This report is blatant political propaganda parading as financial analysis. It spends an inordinate amount of time making the case for more police officers and fewer fire fighters. I am sure that has nothing to do with the fact that Turner is in bed with the police union and at war with the fire fighter union. I will have more to say about this $565,000 propaganda statement later, but taxpayers should see it for exactly what it is: The opening salvo in the battle to repeal the property tax cap so you can pay more in property taxes. If you would like to receive our posts by email, send your address to weking@weking.net and we will add you to our distribution list.